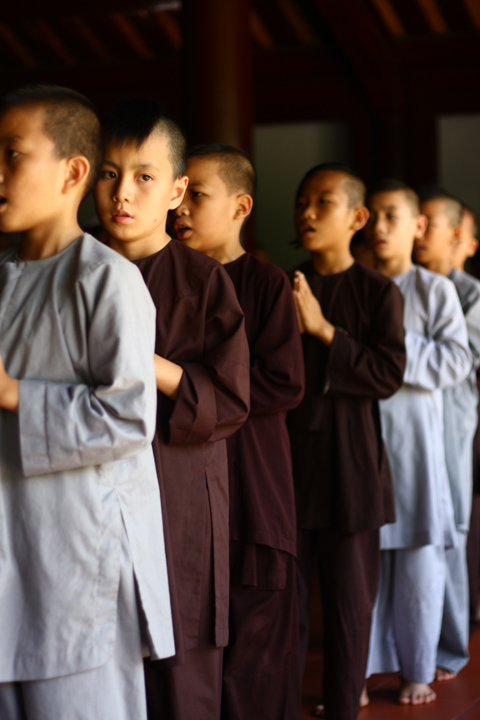 Homeless childen seek food and shelter and arrive at the Pagoda where they grow up as young monks. This photograph was taken in Central Vietnam. First Impression: A nice shot and the isolation works well and as your lone commenter suggests a little more isolation would have made this even better. This appears to be a candid shot and whilst I'd not suggest you staged it if the singled out boy had been in blue with the rest in brown this would have been closer to a 7 than a 6 imho. Composition: I like the composition and reading your comments makes it all the more poignant. Subject: Its good to see the boys washed and in clean clothes ready for food even though they are homeless. Its sad but imho if the boys were in rags you'd probably have scored a few tenths higher. Final thoughts: A great shot, maybe not something that would get hung on a wall but as social history it hits the mark. This got a 7 from me during voting btw. I gave this a 6. I liked the capture and concept. Wanted to see the 'young monk' isolated a little more and a little sharper. Proudly hosted by Sargasso Networks. Current Server Time: 04/24/2019 12:48:31 PM EDT.